[A] hugely entertaining dramatization of Plato's "Allegory of the Cave"...a fable that would be relevant 50 years earlier and no doubt will remain relevant 50 years hence. 103 min. Paramount Pictures. Directors: Peter Weir, Michael J. McAlister. Cast: Jim Carrey, Laura Linney, Noah Emmerich, Natascha McElhone, Holland Taylor. Before Survivor, before Big Brother, The Truman Show postulated a reality-TV series that goes too far. In 1996, reality TV had yet to cross a number of frontiers we now take for granted, though since 1992, MTV's The Real World has fostered fishbowl environments in which "reality" has been allowed to unfold, a new precedent. Imported reality concepts like Survivor (2000- ) and Big Brother (2000- ) would refine the idea by enlisting participants who relinquished control and privacy to compete against each other in supposedly "real" environments: a secluded island and a house, both infested by cameras. Of course, intrusive documentaries, like An American Family (1973), had already contributed to the culture. More insidiously, TV had tolerated "ambush" shows since its inception. Allen Funt's Candid Camera, first broadcast on TV in 1948 (and on radio a year earlier), set a standard followed by shows such as TV's Bloopers and Practical Jokes and Punk'd. In 2005, William Shatner swindled a whole town on Invasion Iowa, and in 2003, a reality show was faked for the "benefit" of an unsuspecting stooge on The Joe Schmo Show. Andrew Niccol (Gattaca) undoubtedly thought he was letting his imagination run wild when he devised The Truman Show, a screenplay about a man who, for all intents and purposes, is born into captivity. "The first child to have been legally adopted by a corporation," Truman Burbank became a reality-TV star as an infant and has lived his entire life in a convincing ecosphere that is his only reality. The 24-7 show's creator is Christof (a name that sounds suspiciously self-styled), who explains, "It isn't always Shakespeare, but it's genuine. It's a life." In a stroke of casting genius, Jim Carrey plays Truman. The seriocomic role gave Carrey the perfect opportunity to mature as an actor, and director Peter Weir (The Mosquito Coast) benefited from an actor whose style was irrepressibly heightened and peculiar, fitting for a character whose emotional journey had been calculated from without himself. Truman has a semi-genuine best friend, from childhood (Noah Emmerich), and a wife (Laura Linney). To Truman, they're trusted loved ones, named Marlon and Meryl (no coincidence that they share their names with the most famous screen actors), but they're paid performers who know what Truman doesn't: his life is a lie. Truman lives in Seahaven, an island community designed to curb his yen to explore and keep him fearfully in his place. The squeaky-clean, Norman Rockwell suburbs evoke America's rose-colored media self-portrait in the 1950s, a lie that encouraged suppression and ignorance of domestic turbulence and political unrest. That his artificial surroundings contribute to his lack of authenticity as a person reflects a social history of keepers (governments and corporations and media) telling us what to want from our lives. As long as people don't ask questions, they remain passive and pacified and, therefore, under control. As Ed Harris' Christof puts it, "We accept the reality with which we are presented." Truman's "reality" is disrupted by a series of accidents. Christof's crew (including Paul Giamatti) can scramble to explain away falling lights and errant radio transmissions, but the real damage was done when Truman fell in love with the wrong woman, a lovely extra played by Natasha McElhone. Christof whisks her away (she's said to be relocating "to Fiji"), and Meryl works overtime to throw herself at her assignment, but Truman's heart belongs elsewhere, even as he settles for a loveless marriage. Truman rhapsodizes about Fiji and the trip he insists he'll take, though—like so many human workhorses—he never seems to get any closer to his carrot. To do so, he'll have to overcome his programmed fear (of water) and broaden his frame of reference: see outside his box. In essence, The Truman Show is Niccol's hugely entertaining dramatization of Plato's "Allegory of the Cave" (revisited to greater popular success in the following year's The Matrix), which illustrated how reality is limited to perspective. Of course, Plato's puppeteers grow closer to Orwell's "Big Brother" in Seahaven, whose omniscient, all-powerful God-figure is literally a man in the moon. The control room is secreted in Seahaven's moon, which doubles as a searchlight (the camera-infested island of no escape also recalls Patrick McGoohan's The Prisoner). Throughout the film, Weir indicts the viewing audience in Truman's travesty. 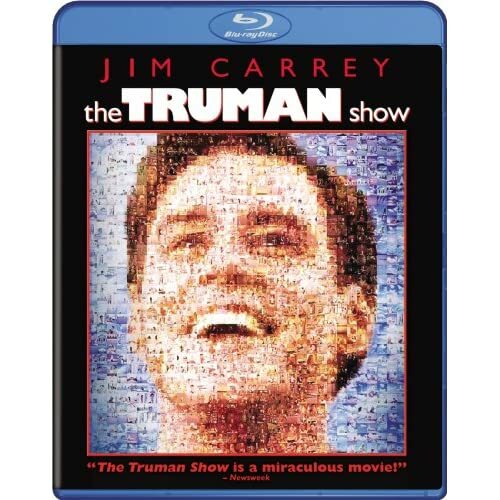 The film begins with a promotional featurette about "The Truman Show," with cast interviews (Hanna: "For me, there is no difference between a private life and a public life") and regular camera-eye views to remind us of the show's parameters. The slogan "How's It Going to End?" describes the soap-operatic voyeurism that is reality TV's high-stakes appeal, and Weir includes brief scenes of "The Truman Show"'s everyday-people audience: old ladies parked on their couch, night-shift security guards, the denizens of a bar where Truman's always on the TV. Part of the film's appeal is its level of detail. Weir insisted that every contingency be considered to make the seemingly outlandish "Truman Show" as possible as possible. Hilariously obvious product placements explain the show's budgetary structure (in the last decade, placements have become nearly this obvious), and the orchestration of Truman's life-drama is carefully considered—each trauma is scored, live, and occasionally even broadcast in slo-mo. Weir slips in UNUS PRO OMNIBUS, OMNES PRO UNO ("One for all, all for one") as a Seahaven motto, but the film's wittiest joke comes when Christof appears with a chat-show host (Harry Shearer). The Hague calls in to speak to Christof, but doesn't make it on the air. Weir always pays close attention to music, and though the score is officially credited to Burkhard Dallwitz, Weir samples themes by Mozart, Chopin, and Brahms, and features several selections by Philip Glass. Weir allows the purposefully drecky "Truman Show" score to break way for fuller music when Truman begins to have his epiphanies. Production designer Dennis Gassner does bang-up work, as does cinematographer Peter Biziou. I won't tell you how Truman's story ends, but it does involve a test of reality, with overtones of the end of the world: a judgement day for the Everyman. From the ridiculous (Truman playing pretend in a mirror that's actually two-way, coneealing a camera) to the sublime (the unsettlingly lyrical moment when Christof pats a night-vision of Truman's nose on a giant screen), The Truman Show broadcasts a fable that would be relevant 50 years earlier and no doubt will remain relevant 50 years hence. The Truman Show's Blu-ray debut is somewhat of a mixed bag. On the one hand, the film has never looked better on home video. On the other hand, the disc, which derives from the same hi-def master as the 2005 DVD Special Collector's Edition, suffers from the previous edition's most notable visual flaws: a substantial amount of dirt and a slightly shifty frame that persists throughout the film. Otherwise the transfer represents the nine-year-old film well, with notably vibrant color and excellent detail. Sound gets a welcome hi-def upgrade, now presented in Dolby TrueHD 5.1; the music and effects get a nice boost, especially in a robust low-end felt particularly during the climactic storm sequence. As on the DVD Special Collector's Edition, Paramount here includes four deleted/extended scenes, totalling a little over thirteen minutes: "Product Placement" and "Truman Suspicious" (actually montages of trims), "The Future Cast Meeting," and "Truman Missing." Since these are unfinished outtakes, the image is blurry and time-coded, but the scenes are very welcome as an insight into the extra bits of narrative coverage Weir shot and chose to discard. A photo gallery offers 40 production stills, with an emphasis on looking behind the scenes. The two-part documentary "How's It Going to End? The Making of The Truman Show" runs approximately 42 minutes, and collects new interviews with Peter Weir, Ed Harris, Laura Linney, Noah Emmerich, producer Edward Feldman, production designer Dennis Gassner, and visual effects supervisor Michael McAlister. Jim Carrey appears, but in a vintage electronic-presskit interview. The engaging doc reconsiders the clairvoyant satire nine years later, and reveals some of the secrets of the production: the screenplay went through at least 10 drafts, for example, and Weir wrote an extensive backstory for Christof and a history of his show. The emergency casting of Ed Harris is retold (though his predecessor Dennis Hopper is never mentioned by name), and Harris chuckles over his experiment with a hunchback for the character. The filmmakers discuss the risk and payoff of casting Carrey, and the invaluable Florida location known as Seaside, a kind of manufactured town akin to Disney's Celebration, also built in Florida. A second documentary, "Faux Finishing: The Visual Effects of The Truman Show," allows Gassner, McAlister, and visual effects supervisor (for Matte World) Craig Barron to explain how they achieved the "hyper-real" look of Truman's artificial environment. Working against their usual mandate of realism, the effects wizards allowed the design be overt instead of subliminal to the audience. Establishing the world as an interior soundstage is still pretty subtle stuff, with touches like a curved horizon. In a neat bit of trivia, the doc also identifies McAlister as the guy in the door of the ecosphere in the pull-back shot out of the dome. Two 30-second "TV Spots" are here, as well as the full-screen "Teaser Trailer" (1:52, HD) and a spoiler-ridden widescreen "Theatrical Trailer" (2:33, HD). In this case, the teaser trailer is preferable, as it's a short film in itself, a promo-within-a-promo hosted by Harry Shearer's TV-host character and obviously designed or, at minimum, approved by Weir. I doubt Weir approved of the theatrical trailer, with its unnecessary evil of giving up so much of the plot. With a nice (if not quite comprehensive) collection of special features, this exceptional film only gets better on Blu-ray. All site content © 2000-2019 Peter Canavese. Page generated at 04/18/2019 02:15:15AM.